The last 8 days' weather has been unusually clear for us in the Midwest, a golden opportunity to try out my new Rasa 8. As I get more familiar with the 1600MM camera, I'm finding a slightly lower gain helps in my Bortle Class 5 skies. I reshot Markarian's chain the other night at gain 76, but was disappointed in the way the flats seemed to be correcting the image. The centers of the stars had small black dots just off center in each of the stars and there was a general unevenness to the image, as if the flats weren't doing the job. I wasn't sure if this was my processing in this image or something to do with the flats themselves. Normally, I'd set my Spike-A panel atop the dew shield to take my flats. At F2, the Spike-A panel has to be set very low in brightness in order to get something like 28K ADU.  So low, in fact, that out of 1026 brightness levels, I have the panel turned down to 1 with an exposure time of just .04 seconds. Since the images with flats at this setting were giving me issues, I thought I'd try a different approach. I had read in a recent Jon Rista post that he's using sky flats again. Something about collimated light that seemed to be better than using a flat panel. I wondered if I couldn't do the same thing, but use the night sky itself as the light source. Since my Spike-A panel was so dim as to be almost black anyway, I figured something like parchment paper over the top of the dew shield might provide a sufficiently diffuse surface to act as a panel, lit by light pollution, if you will. The other night I made up a test flat panel, made of cardboard and tape. 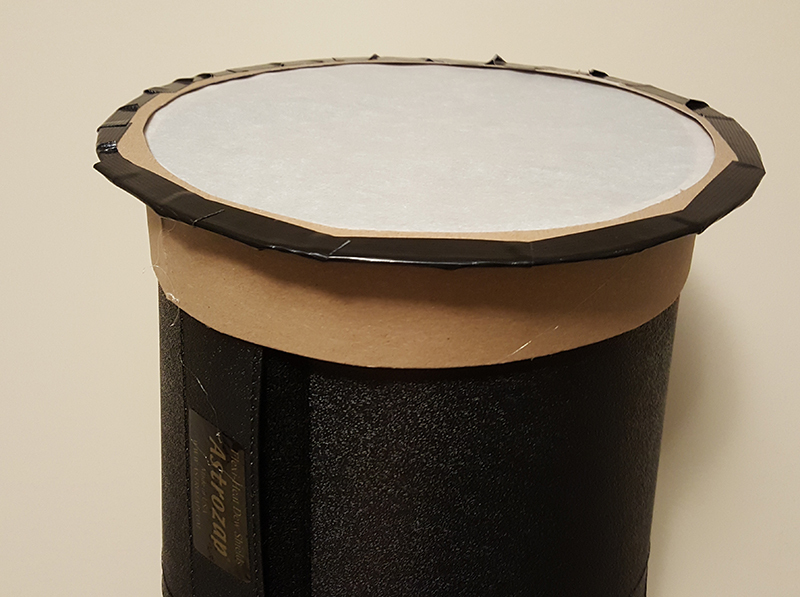 A cardboard ring holds the slips over the dew shield, while a flat ring of cardboard on top forms a drum head, sort of like a tambourine. I set this atop the dew shield and started taking pictures, monitoring the ADU in TheSkyX. At 15 seconds I was getting 7800 ADU. I had spoken to andysea about this subject and he said that that was the number he was shooting for in his flats. I then took two sets of flats; one the normal way, with the Spike-A, the other with Nightflats, as I call them. 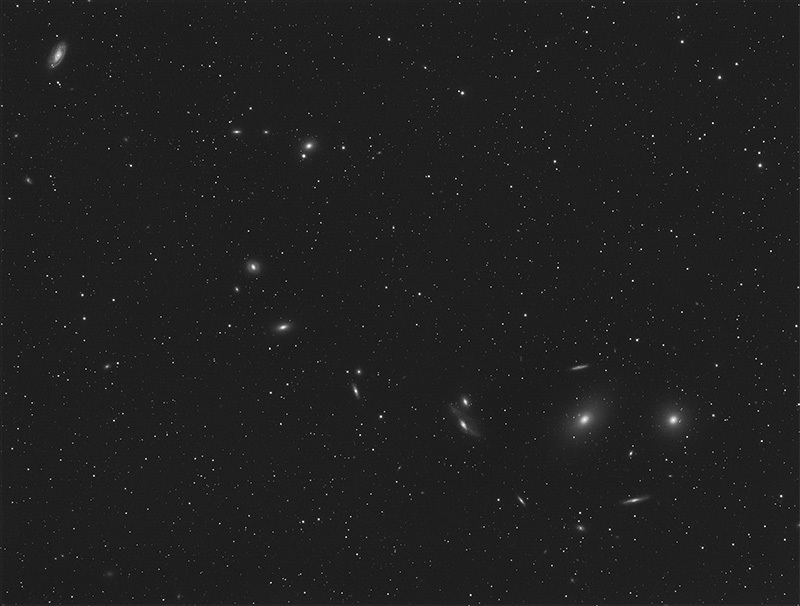 And here's the new Markarian's Chain image calibrated with 15 second 'nightflats'. I processed the bulk of this in APP, using DBE in Pixinsight to clean up the last of of a faint gradient in the image.  The gradient was very minor, but was noticeable if you looked for it. At any rate, I was quite pleased with the way the image turned out. I'm putting this information out there for anyone else who might have issues shooting flats with a Rasa. This in no way should cast a bad light on the Spike-A panel itself. It performs excellently with my slower scopes like my F6 refractor and F10 SCT. 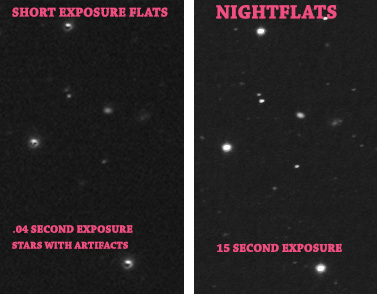 Here's a side by side example of what I was seeing in the .04 second exposure flats vs 15 seconds. This is incredibly helpful information! Thank you so much for sharing this experiment and your results. I will try taking some "nightflats" the next time I take the RASA out for a spin Do you mind if I share your experiment in my article about the 8" RASA? I'm a Bortle Class 6 - so for once, my light polluted skies will contribute to my astrophotography in a positive way! Thanks for the kind words, Trevor. Yes, by all means share the information! I'd be curious to hear if you could reproduce the same results by taking your nightflats with your own rig. My scope isn't nearly as fast but I also had flat problems with short exposures. I ended up putting neutral density filters intended for a portrait flash unit in front of my Gerd Neumann EL panel to dim it down and going with 5 second flats. EL panels display flicker with short exposures. Edited by lakeorion, 29 March 2019 - 02:53 PM. lakeorion, good call with the ND filters. I almost went with several layers of parchment paper or light posterboard over my flat panel to do something similar. I also had read something about even biases having issues (readout?) when taking exposures less than 1 second and to instead take dark flats. 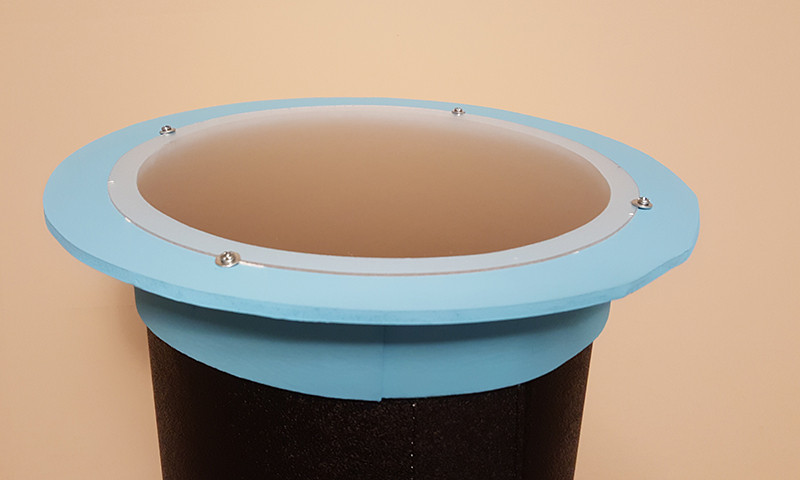 I redid the cap and replaced the parchment with .050 non glare acrylic. It's used as a replacement for photo frame glass. It holds up much better than the parchment paper which tended to wrinkle when it absorbed moisture from the air. I painted the foamcore as well, the gorilla tape thing wasn't doing it for me!